Kumar Bhaskar Varma Sanskrit and Ancient Studies University Recruitment 2017- Computer Operator & LDA Post: Last Date 12-05-2017. - Jobs4NE : Jobs in Assam and North East India. 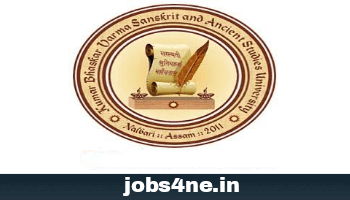 Kumar Bhaskar Varma Sanskrit and Ancient Studies University Recruitment 2017- Computer Operator & LDA Post: Last Date 12-05-2017. Applications are invited for the following posts from Indian nationals possessing the ardour to go an extra mile for growing with a new University committed to furtherance of knowledge and societal needs. Advertisement: No- Reg. 15/2012/101. Last date for submission of Application: 12-05-2017. Name of the Post: Computer Operator. No. of Posts: 2 Nos. (SC- 1, UR- 1). Essential Qualifications: BCA/ PGDCA/ B. Sc (IT) or an equivalent degree in Computer Application from any UGC/ AICTE recognised University/Institution (preferably in face to face mode) having good communication skill in English, Sanskrit and regional Language. Scale of Pay: Rs. 5200- 20200/- + GP Rs. 2500/-. Name of the Post: Lower Davison Assistant (LDA). No. of Posts: 4 Nos. (OBC/ MOBC- 1, ST(P)- 1, UR- 2). Age Limit: As on 01-01-2017, maximum 43 years. Upper age limit is relaxable as per Govt. norms. Essential Qualifications: Graduate from any recognised University with good communication skill in Sanskrit, English and regional language and proficiency in computer works with degree/ diploma from recognised institution. Application Fees: Rs. 500/- (Rs. 250/- for SC/ST candidates) only in the form of Demand Draft/ Banker Cheque in favour of Registrar, Kumar Bhaskar Varma Sanskrit and Ancient Studies University and payable at Nalbari.